We do not have the style code, prices and sizes right now. With 8 collections every year, Chanel has long devoted one to Métiers d’Art, in short, Chanel’s way of preserving years of craftsmanship and heritage. Under its Paraffection subsidiary, Chanel now has 9 different old-world ateliers in their fold, each one specialising in a different craft that might have otherwise been lost to the world if not for the French luxury house’s patronage. Through each collection, the ateliers get to showcase their brilliant skills and expert craftsmanship that includes everything from the use of expert embroidery to working with feathers; some specialise in textiles like tweed, others make the best shoes money can buy. Yes, the #ParisCosmopolite RTW, bags and accessories that you’ll now find at Chanel’s first Ephemeral Boutique at Marina Bay Sands is all from the Métiers d’Art collection, and this would be your chance to head on down and admire these beautifully crafted pieces up-close. With some of them having been around for over a hundred years, the 9 ateliers still focus on traditional craftsmanship that takes painstaking hours often worked only by hand. And by safeguarding these 9 ateliers, Chanel is trying to ensure that even into the distant future, these age-old crafts will still be around for generations to enjoy into the future. And because covering all 9 ateliers in one post would be too intensive, we’ll start with 3 that focus on the ‘small is beautiful’, starting with Desrues, Goosens and Lemarie. These 3 different ateliers produce the small, often overlooked pieces that one doesn’t often pay much attention to, but because of this trio, the ordinary can be made extraordinary. Found in 1929, this is the atelier that is responsible for creating, chiselling, gilding, sculpting, even polishing buttons. Yes, buttons. With almost 4000 buttons produced daily, Desrues handles the creation of each individual piece, starting with a prototype before going into production once the final design is approved. And because it is for Chanel, each button is always beautifully adorned, the end result often little works of art that you’ll find used on everything from RTW to bags, even shoes and accessories if the design calls for some button detailing. A jewellery house founded in 1950, it is one renowned for its expertise in working with metals that includes bronze, silver and gold. Gabrielle Chanel loved the way founder Robert Goosen’s reinterpreted jewellery were inspired by great eras of antiquity (think Byzantium and Egypt) and engaged him to produce metalwork for the house, constantly pushing him to play with the ambiguity of real and fake, all of which are shown beautifully through his gorgeous metalwork. Now helmed by Patrick – Robert’s son, many of the fancy jewellery pieces you find at Chanel today that has the most intricate of metalwork probably came from the Goosensworkshop. Wonder where all those iconic camellia brooches you know and love come from? Founded in 1880, the camellias that we have all come to associate Chanel with were first handmade by Lemarié. Commissioned by Gabrielle Chanel herself in the 1960s, this atelier specialises in creating pieces that have come in almost every material you can imagine, from chiffon to denim, leather, silk and even velvet, just to name a few. Don’t be fooled by the seemingly simple flower; it takes about 1 hour just to shape its 16 petals by hand, and those are just the basic ones. So the next time you add a camellia brooch to your collection, take time to appreciate the amount of handiwork that goes into each piece. And there you have it, a camellia brooch that can elevate any look, bold metal jewellery that’s always almost statement-making, intricate buttons on a tweed jacket that’s the perfect finishing touch, these 3 ateliers also teach us a simple fact. No matter how small each part may seem, every piece has its part to play in making the final product look beautiful and extraordinary, the small made beautiful. The Chanel So Black line is what made fans excited to run into the boutiques. And it’s a topic that has been talked about a lot. So what is the Chanel So Black? So Black is a term used in the fashion world to describe a Chanel bag or an accessory that is made in black leather with black hardware. This combination is very rare and it’s only limited available in certain seasons. Usually the So Black design is crafted in iconic handbags like the Chanel Classic Flap Bag or the Chanel Boy Bags. But the unusual happened in the Chanel Spring Summer 2017 Collection. We have spotted multiple handbags and accessories that are crafted in the So Black design. 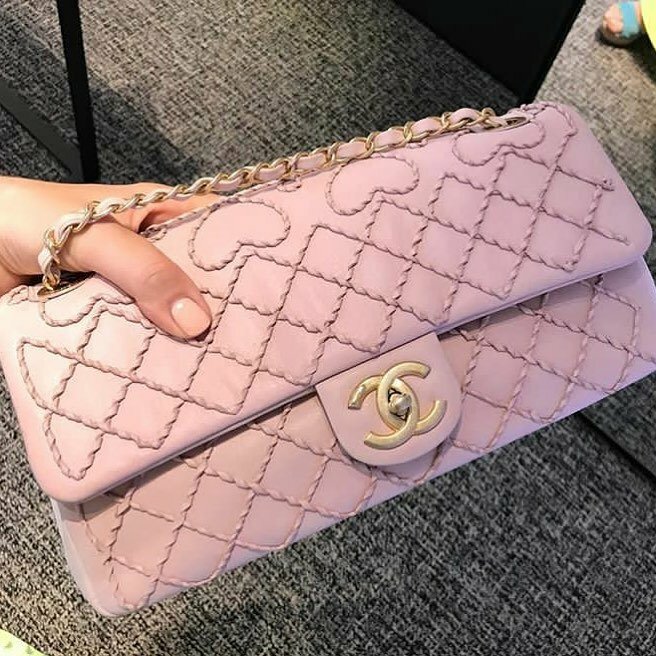 The items range from the Chanel Classic Flap Bags to the Chanel Reissue 2.55 and with new designs like the Chanel O Cases in Reissue 2.55 style and chevron studs. And what’s more? There are two types of black hardware’s. One is with ruthenium black metal, which is a bit more greyish. And then there is a style in black metal black, which is entirely in black. The Chanel So black style is not made in ruthenium black metal, but in black metal black and it is considered very rare, but is it still rare today? Now that there are many So Black styles available for the Spring Summer 2017 Collection, it seems like the limitation has disappeared. We will be sharing all the styles that we can find here below with the details you need to shop and spree. So what do you think?